Aren’t those the cutest little gathers you ever saw? Those were my two lines of test gathers. Thea did show me how to use the gathering foot slit to attach a second piece of fabric to the gathered piece, but it’s a technique I will have to practice for quite a while before I trust my talents on a real garment right now. But basically the key to using that function of the gathering foot (aka, my boyfriend), is holding both of pieces of fabric firmly, stitching slowly AND, most importantly, every two or three stitches, straighten out the fabric in the slit (as it has a tendency to move to the left). Do you want to see my boyfriend in action? I have no idea how my boyfriend works his magic. None! All I know is that I love the results and the fact that I don’t have to do two rows of stitching and then gather it evenly myself. How cool is this???? So I bet you were all holding your breath until I told you which zipper I went with for the dress. Thank you for all your opinions. The overwhelming majority of you thought the beige zipper was the best. A couple chose the pink and one chose the purple. Most agreed that the bluish purple one was too blue. And most agreed that as it was an invisible zipper, that the color didn’t really matter. Thea thought the beige would be best. I have to note, that Carolyn’s rule of thumb for choosing zippers is to choose a darker color and she thought the purple was the best. I will admit to doubting Carolyn’s advice as I was worried the purple was too dark for the print part of the bodice and that you would see its shadow. Well, I sewed the beige zipper in last night and…. I don’t like it. Also my zipper insertion is not quite perfect. So I think I will rip it out (not literally of course) and put in the purple one and hopefully the insertion this time will be perfect. 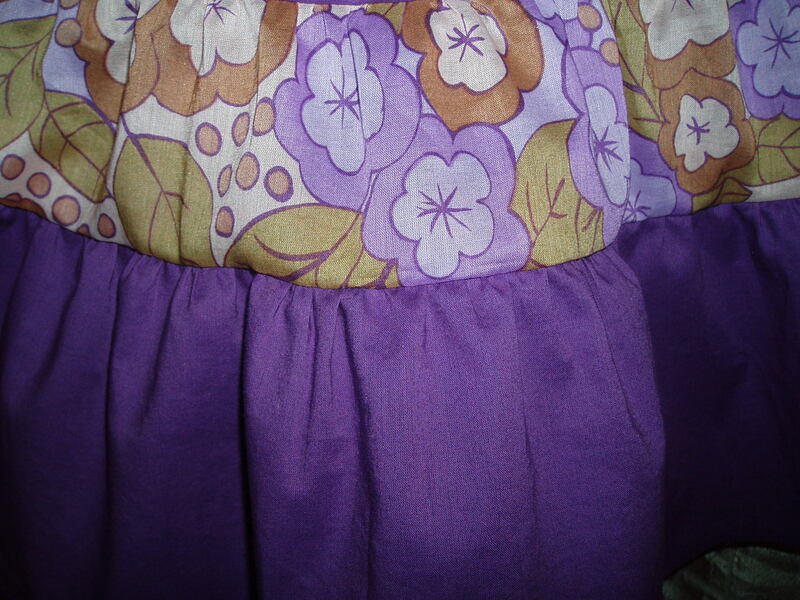 I just didn’t like how the beige would peek out occasional from the field of purple on the skirt section which runs the majority of the length of the zipper. I am almost done. 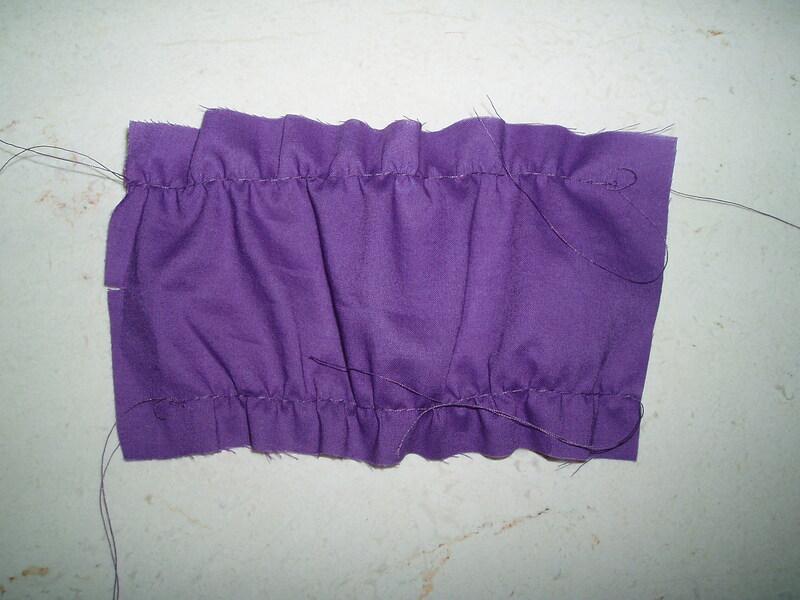 Just need to reinsert the magenta/purple zipper, hem the bottom ruffle, serge the seam allowances and finish the lining on the bodice. I actually think that’s all doable in an evening, but I am known for having unreasonable expectations, so who knows if it will be finished tonight or not. I hope so though — I have more SFO (Sewing For Others) to do. Happy sewing and gathering everyone! 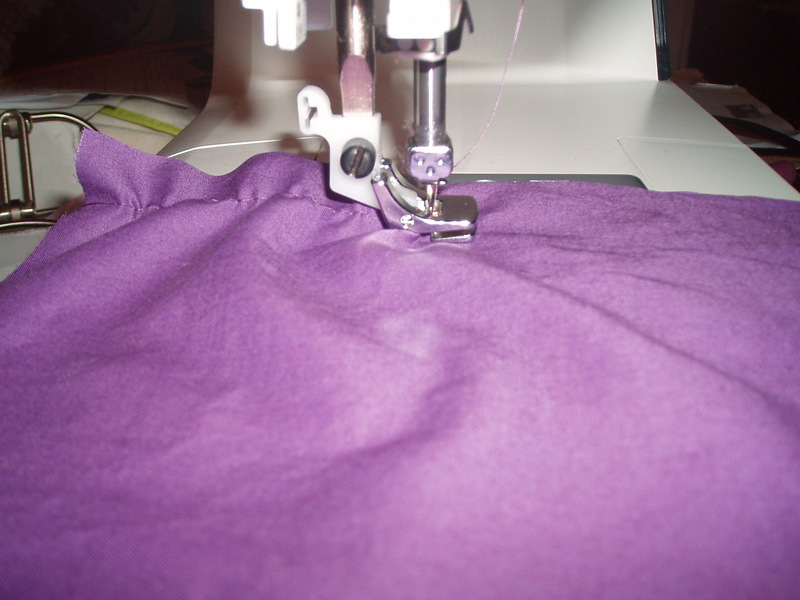 This entry was posted in Beginner, Crafting for others, Dresses, Gadgets, New Look, Sewing, Thea. Bookmark the permalink. I never knew men as good as this existed. Very nice but personally I would like to see you dating a ruffler. Great work. The only thing better than this little guy is a ruffling foot is one which sews the two pieces together an ruffles at the same time. 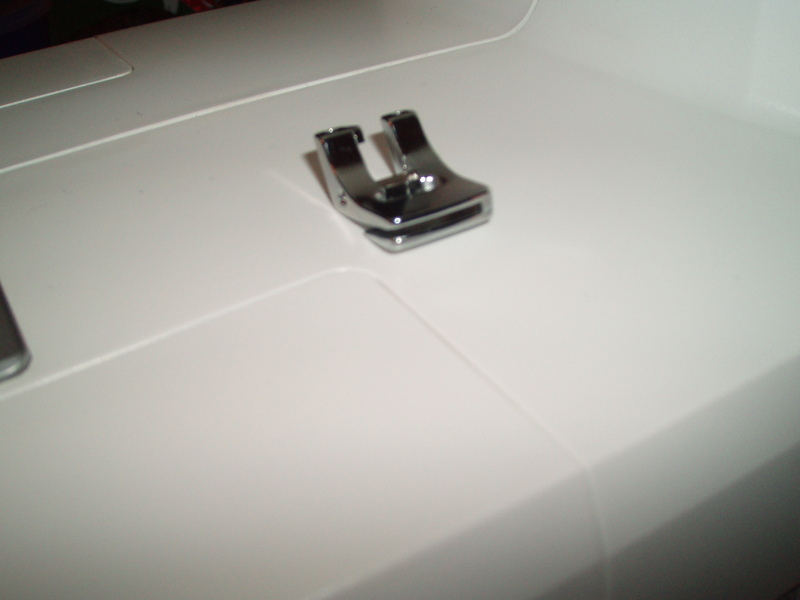 I’ve had one for my Bernina which works well but the one for my serger is unbelievable. Enjoy! ppease shoot mme an e-mail iif interested.